Discussion in 'The Americas' started by brahmos_ii, Mar 1, 2013. The U S Air Force (USAF) has selected the Embraer Defence and Security's A-29 Super Tucano for its Light Air Support (LAS) programme. The aircraft will be used to conduct advanced flight training, aerial reconnaissance, and light air support operations. The contract worth $427 million has been signed for 20 Light Air Support (LAS) aircraft, as well as ground-based devices to support pilot training and all maintenance and supply requirements for the aircraft and associated equipment. The A-29 Super Tucano is a robust, versatile and powerful turboprop aircraft capable of carrying out a wide range of missions, including close air support and intelligence, surveillance, and reconnaissance, according to Embraer. The aircraft is equipped with advanced electronic, electro-optic, infrared and laser system technologies, as well as secure radio systems with data links and unrivalled munitions capacity. The aircraft in use with nine air forces around the world has employed state-of-the-art munitions on real operational missions. It will be supplied in partnership with Sierra Nevada Corporation (SNC) as the prime contractor and will be built in Jacksonville, Florida. Internal: (2x) 12.7 mm (0.50 in) 950 rounds a minute FN Herstal M3P machine guns in wings. pod: (1x) 20 mm (0.79 in) 650 rounds a minute GIAT M20A1 cannon below the fuselage. pod: (1x) 12.7 mm (0.50 in) FN Herstal HMP for M3P machine gun. pod: (4x) 7.62 mm (0.30 in) 3,000 rounds per minute Dillon Aero M134 Minigun (under development). SMKB-82 (under development) – Mectron/Britanite INS/GPS guidance kit for Mk 82. Lizard – Elbit laser guidance kit. Griffin – IAI laser guidance kit. Training and Operation Support System (TOSS). An excellent platform for COIN operations, and a cheaper one as well. I hoped India would select Tucanos instead of Pilatus. On another note, after 4-5 years down the line, it's logical for them to acquire 2-3 squadrons of L-159 Light multirole fighters for advanced training and ground attack. Prices shouldn't be a concern at $18 million a piece. Smart move to bound Brazil to them and get the FX2 order for the Super Hornet! Well, ofcourse it was a great idea using a prop plane for cheaper operations. Still I would prefer an aircraft with bigger load capacity. Brazil is a difficult case and many things must be considered there, in comparison Indias MMRCA deal was simple and fast. 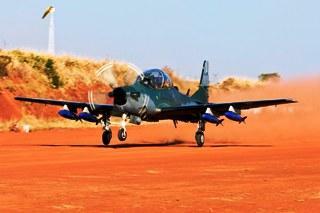 i will definitely go for tucano if the suitable conditions for it to operate exist. Just how long has it been since they began looking for new one ? though these r supposed to b employed in LAS role, just how reliable these r.
the A-10 can survive a hit from a MANPAD, can these do that the answer is no, in all probability. I think its more of political decision for improving the chances of SHs. and when flying at an altitude of 500+ Mtrs. I think at the best it is some what an upgraded and lighter version of iaf'mig23 with some new generation ew suit and sensors.